On August 1, 2017 we moved to a beautiful townhouse in Amsterdam’s city centre. This is the story about how the new interior style has been conceived. My name is Sandrine Botilde-Doré, I’ve been living in Amsterdam for 5 years. I’m a traveller at heart, a nomad. I moved here from the South of France, but have also lived in Mali, Guinea, Belgium, Switzerland and France. Before coming to the Amsterdam Fashion Academy, I was already working in the fashion industry, being mainly involved in PR and events. I realised I wanted to learn more about the business side of fashion and so I started studying for a BA in Fashion Business. Then my second child was born and I took a year off. Now I’m back again, this time studying Fashion Design. I decided that studying fashion business was really my comfort zone and that I wanted to explore the process of garment making. I can use my background in fashion marketing to build a brand which will be ready by the end of this year. It’s a big challenge and I am working hard. 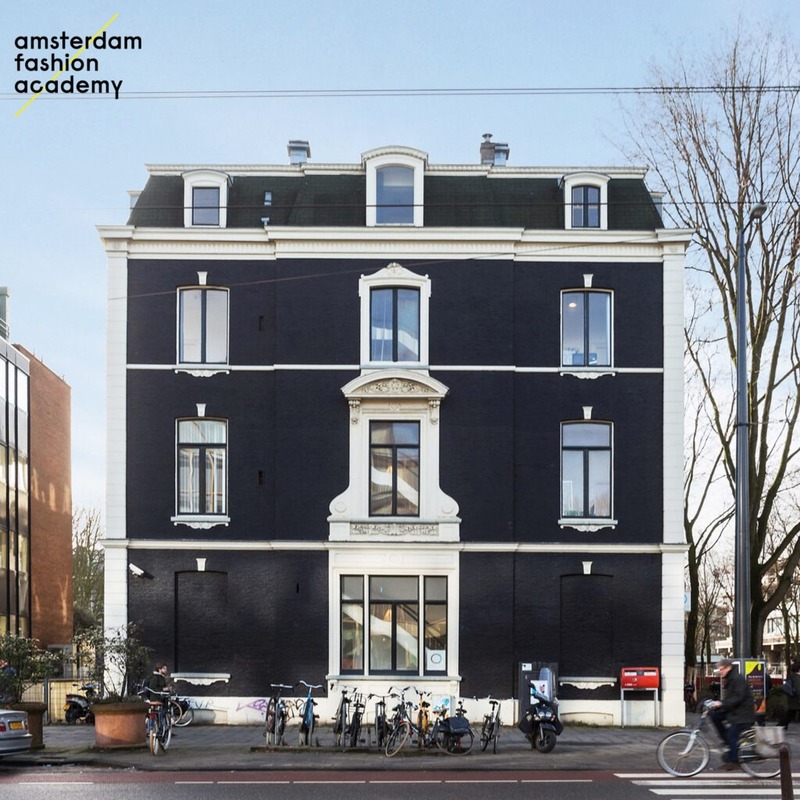 I am grateful to the Amsterdam Fashion Academy for giving me the opportunity to decorate the building and design its new interior style. Interior design is something that I have always loved. I adore second-hand furniture. Furniture is timeless: if you buy the right pieces, they can stay with you forever. Most of the pieces I found for the library, for instance the chairs, already have a long history. We have to learn to be more sustainable in the way we consume. There are so many things which already exist that we can re-use. The bookcase and the 4-meter long table now in the library were found in this way. It took me 6 hours to pick up the table, but I was really motivated to have that piece. I also didn’t know what kind of lamps to put in the library, so I thought “let’s create one”. I decided to use different kinds of lamps to reflect the diversity of the academy. Moreover, I didn’t want to use fixed lamps because I wanted a flexible space: one where the table can be made smaller and moved depending on the situation. I don’t have a particular style that people can instantly recognise. What I did was mix and match styles. We could have gone for only using modern furniture, with the same colour, but then we would have turned this International Fashion Academy into a showroom. I wanted to give the Academy’s interior style a hotel-feeling. It is a boutique academy where people should not feel like they are at school. I wanted to give them a pleasant atmosphere conducive to developing skills and learning. I wanted personality. The space that I am most proud of is the basement, the student lobby, even though it is not finished yet. It was a real challenge. The space was limited by its low ceiling, light wooden floor and low lighting. The opposite of all the other floors of the building. I didn’t know what to do with the space, I just knew I wanted to design a space where students could feel good and chill. I am particularly proud of the colourful chairs and poufs. I drove to an antique store at a riding school to pick them up and spent a whole day cleaning them! But now I am more than satisfied since it is these elements with their bright colours which light up the members lobby. I am also proud of the library, although it was the most challenging space. It was extremely difficult to find the right bookcase for the 5-meter wall. I wanted one to fill the wall completely, with no spaces and, of course, it had to have a style which fitted with the rest of the library. An elegant mahogany table full of poise and purpose really needs an accompanying mahogany bookcase. We were really focused on this, as it was to be the central piece for the most central space of the Amsterdam Fashion Academy. And I can proudly say that the bookcase I found is perfect! How would I describe the interior style of the Academy? First, with the word “second-life”, because I wanted to give antique but precious pieces a new use; then with cosy and sophisticated hotel-vibe, and finally I would describe it as a timeless style. One word that I didn’t have in mind was school. I wanted and went for quality.